There are a lot of misconceptions being posted on the various forums lately regarding fantasy swords being so much more ornate than anything history has brought us. Fact is, there's an extremely large segment of the sword collecting hobby that has reached the conclusion that nearly all historical swords are somewhat boring and that the only truly decoratively ornate swords available are those of modern fantasy. I submit that this opinion is not only completely wrong, but a sign of a severe lack of doing one's homework and perhaps even a sign of people concluding that available historic replicas represent all samples of authentic pieces. 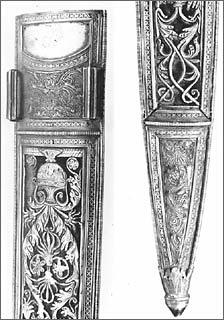 While I won't even attempt to debate what constitutes "beauty", I will say that we can objectively look at a sword's level of ornate decoration and compare it to another and decide which is more "complex" with its ornamentation in regards to the level of artisanship requires to make each. 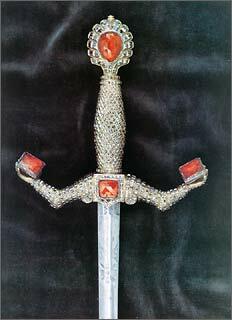 As a single example, how could one say that the sword shown below lacks the level of ornamentation of say, a movie replica sword from The Lord of the Rings? The simple fact is, this sword not only matches the amount of details present in any of the movie swords, but in many ways surpasses it. Truly, this sword has at least as much detailed carving and engraving on it than any of the fantasy swords, utilizes more valuable materials, and requires more sets of individual artisan skills than any of the movie swords do. 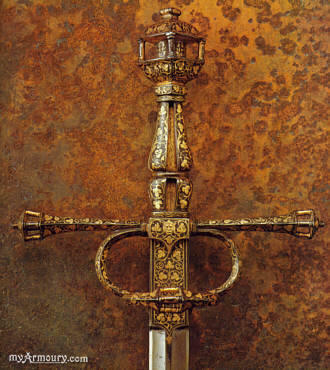 Such skills used on this sword, alone, were those of engraving, gilding, etching, stone cutting, carving, etc., in addition to the work of the smith, including forging, grinding, and heat-treating. Now this is only one sword that history has brought us. But is it unique? 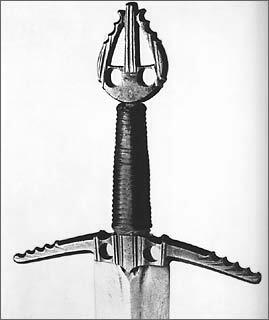 Well, its details are certainly unique: though I am aware of two other swords with similar styles of decoration and proportions. But the level of detail found on this piece isn't unique. 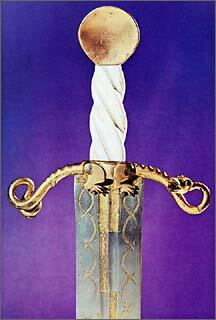 The fact is, this sword isn't all that particularly ornate compared to so many historic examples. 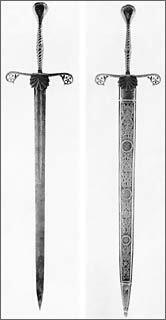 There are literally hundreds and hundreds of swords that share this level of ornamentation, and yet we're led to believe in our community that all (or most) historic swords are simple, undecorated slabs of bare steel attached to a standard blade that looks like every other medieval sword. This opinion is, plainly put, wrong. Some others even go so far as to suggest that those finding value in ornamentation must change their way of thinking so that they can see the subtle shapes, volumes, and lines of the simplistic designs of history and, in turn, find value in that instead. Again, this opinion seems absurd to me, too. While I, personally, happen to be one of those people who encourage people to look at the subtleties of many swords, I would never go so far as to say that a person must retrain themselves from seeking decorative ornamentation. Fact is, history has brought us enough samples of authentic examples to satisfy both tastes. Now please don't get me wrong here: I am not saying that modern-made swords are not beautiful, ornate, or something to find attractive. On the contrary, they are often all of these things. I'm also not saying that the choice to collect and admire fantasy swords is wrong. It isn't. My point in this entire topic is to attack the opinion that decoratively ornate historical swords cannot be found or are comparatively "simple" or "plain" when contrasted with modern fantasy swords. I further want to reiterate that I believe that many people who are holders of this belief simply do not have access to the many books and museums showcasing the types of historical swords discussed here. Truly, I know that many people in our community would be shocked at the plethora of unique, strange, wild, and fantastic designs that history has brought us. I'd even go so far as to predict that many would find modern-made fantasy pieces absolutely lacking in overall presentation when compared to these authentic "fantastical" examples. I'm eager to read your thoughts on this point and encourage us to avoid debating objective definitions of what is and what is not attractive, etc. Please note: I picked the above example because it resembles, in shape at proportion, many fantasy sword designs that can be found in various movies and whatnot. True craftsmanship is always a thing to admire. And I would say this is an excellent example of what history can teach us. Thanks for the topic Nathan. Once again you've brought a very interesting topic to the forefront. All points are well made and I agree completely. Beauty IS in the eye of the beholder and as individuals we (as a community) should come to embrace and respect this aspect. The wealth of information available to those of our hobby is great and out there for the masses to seek out and absorb. The degree of ornamental (functional)replicas is to some degree lacking(IMO) but again, there are excellent examples out there. If I may, here is but one of those that come to mind as a historically, ornamental, functional piece readily available. Sure this to be a long running discussion and am eager to see others responses. That's one of the great things about this site, is the amount of sharing in knowledge and insight, that makes myArmoury so unique. I would definitely have to agree with Nathan. There are a plethora of historical arms and armour that are very ornate and all very beautiful in my opinion. I think that one big reason for thinking that only fantasy pieces can be ornate is because of the exposure to the modern fantasy pieces (ei. in movies, video games, etc.). Not everyone gets an opportunity to go to museums or pickup books on the subject of historical arms and armour. But how many people reading this have seen The Lord of the Rings movies, Excalibur, Conan, Blade or the countless other movies depicting fantasy weapons. Nathan recently recommended a book to me that had information on a sword I was looking for. It is called Treasures in the Dresden Collection by Johannes Schobel. It is out of print and very hard to find, I did a search and was only able to find it from a couple of sources on line. If anyone has a chance to purchase it, I would highly recommend it. In it you will find plenty of weapons and armour that are both ornate and beautiful. 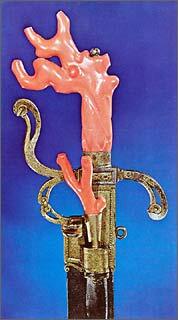 This attachment is a sword found in that book and also found in the Albums section of this website. Also another good resource that everyone has thanks to the myArmoury team is the Albums section that I just made reference to. It is a great place to check out all sorts of different arms and armour from the "plain" to the very "ornate". Thank you for all who have contributed to that valuable resource. Nathan, you've brought up something I've discussed privately with a few folks before. There are in fact a *lot* of highly oranamental pieces to be found, throughout history. Why they are not noticed by many, I do not know, but as a artist and sculptor and newbie bladesmith, I personally like to see what skilled artists have done before (and ofcourse now...). I think that this is going to be a very interesting topic. I think I have a common problem on this forum; I have found very few swords I don't like . I really have to agree with everyone so far. 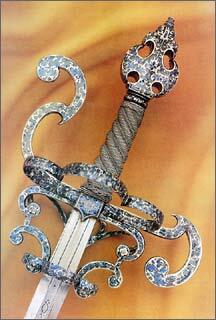 It's the craftsmanship that makes a sword be it fantasy, historical or an inspired custom blade. There are some very well made example in all of these categories. I'd also like to thank you guys for sharing some of your examples. I hope people continue to add pictures. There are some very fine examples here on myArmoury too. 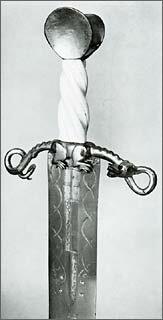 Examples include this Partisan, the Gustav Vasa rapier, the Medici falchion, and more. I look forward to seeing more examples. 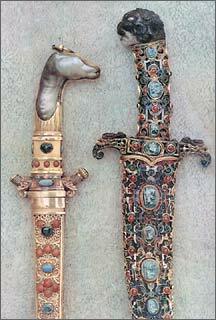 James, does that book contain a picture of an amazingly ornate gross/kreigmesser with matching by-knives? I saw it in a book in the library one time but I cannot remember the name of the book. It is really magnificent. Is this the messer you mention? 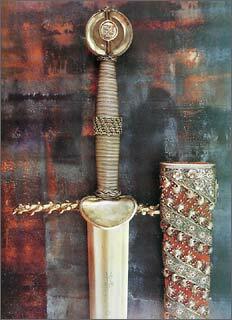 Regardless, it's another very good example of the type of historic sword referred to in this topic. I like the hilt form of the Maximillian grosse messer. I worked up a very simple form of it (digital photo mod) and considered seeing about having one commissioned if I could find a smith willing to do it. Ofcourse, my problem is I don't have the money, so it didn't happen. Wanting to cover a few more basis, I thought I'd share some more examples of historic swords with a "fantastical" flair rivaling many modern-made fantasy swords. I think the single best piece of information to pass along to anyone ignorant of the beauty to be found in historical/performance orientated swords is an introduction to the art of pattern-welding. I have never seen a pattern-welded movie sword - if examples exist, they're few and far between. And so, when I've shown pictures of pattern-welded blades to friends who know nothing about swords beyond those seen in movies, cartoons and video games, I've had the pleasure of watching their jaws drop every time. Forget ornate hilt construction, even forget exotic blade shape - patterned steel transcends the mythic, and trumps the ostensibly fantastic every single time. I do wonder why so few fictional swords utilise patterned blades to up their 'wow' factor though. They're a good bit more common in fantasy literature I think, but that the movies have tended to pass them up is quite bizarre considering the visual nature of the medium. One reason why I've never caught on to the fantasy swords (with a couple of exceptions) is that you see they are designed by modern minds. Another reason is they have no history. A historically inspired reproduction sword should be a time machine into the minds and asthetic sense of people centuries or millennia ago. Very seldom do you see swords completely lacking aestethic sense. 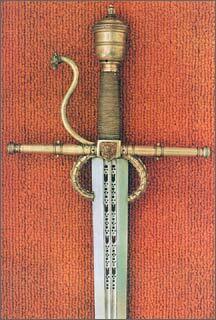 Even the simplest working grade swords show a harmony of proportion and subtle shaping of the cross and pommel. The high end examples are many times decked ot with gold and jewels and even when they aren't they are still so decorated that I shudder to think what a modern reproduction would cost. Man are some of those swords above bad taste. Especially the ones on the upper right and left. I can't say I want to know more about their original owners. You have to look at these things with an understanding of the mentality and taste of the period contemporary with the piece itself. It's flawed to use modern judgement of aesthetics with these things. The point of this topic is comparing levels of ornamentation, not judging its attractiveness. For the record, I totally agree with you. Despite being incredible artistry, they're just plain silly. But this opinion is completely subjective and isn't at all relevant. Yes I agree on that. How old are they? They look very well preserved. Hey Kenneth, I've edited the original post with some dates. some amazing swords! I have seen some jeweled ones before, but not some of the more elaborate designs. I guess most of these swords are ceremonial swords or for special occasions? For example some might be used to knight others, or as a gift to a foreign king? What influenced me the most was when someone said that a sword should be functional, and although that's obvious, it's so simple that non-aficianados would miss it. Some fantasy swords are so impractical (heavy, rat-tail tang, flanged blade etc) that they become too silly. On the other hand - the elaborate swords shown on this page definitely were based on real swords, but perhaps decorated highly by the artisan to represent the value of the recipient. Yet another very interesting topic. Your basic point is well made. 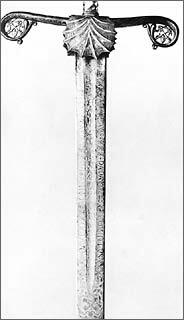 I'd probably step back several hundred years and refer to the many viking and migration era swords (e.g. 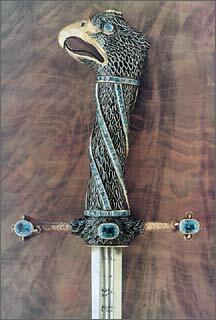 the Sutton Hoo sword) for examples of craftsmanship for purposes beyond simple function. 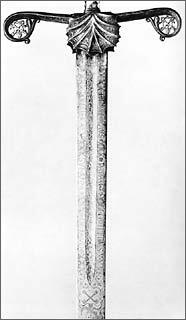 Or one could go east a ways and look at many of the Islamic swords to find levels of bejewelling, inlay, wire work etc, matching or surpassing the examples you've already shown (a wander round the Wallace collection started my re-education in this regard). I know his isn't about personal taste, so apologies in advance, but for me, the ideal would probably be wonderfully decorative craftsmanship that has no significant impact on function (e.g. some Schiavonae [not sure if that is correct plural], the aforementioned Sutton Hoo, or Mr Goodwin's rapier example). I do feel that once you get into the eighteenth century and beyond, the dividing line between modern fantasy swords and 'genuine' historical examples becomes a bit blurred, since the some of the latter may have served a similar role to the former (i.e. 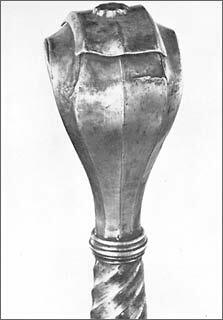 some were produced as decoration based around a form that was formerly functional, not as functional items that were decorated). Anyway, that personal digression aside, thanks for the continuing education. Those examples are real eye-openers. 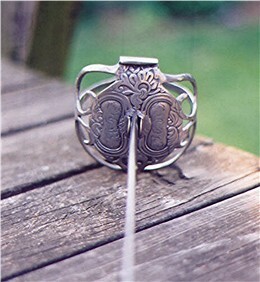 Actually the pic I posted is not a rapier, but my Paul Chen Mortuary hilt. With alot of the more over the top original pieces, one must realize that alot of these were commisioned by very flamboyant aristocrats. The more ornate, the better for them as a reflection of their status. The fantasy swords that I think many are attracted to have the same sort of attraction that a sports car has - the swoopy lines of the body suggest performance beyond the ordinary ... a promise that is sometimes not delivered in cars, but is pretty much never delivered in these "fantasy" swords (exceptions being the ones we know about J. Samson, the Christian Fletcher Atrim upgrades ...).